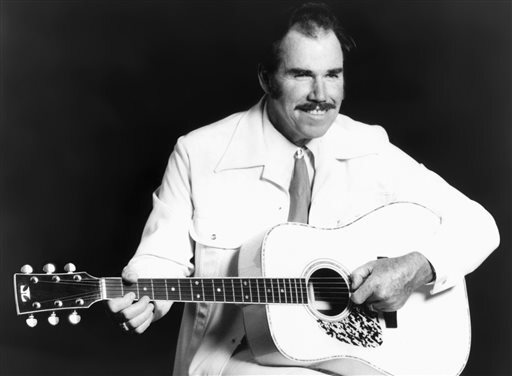 LOS ANGELES — Slim Whitman, a country pop singer whose forlorn wail influenced a generation of vocalists in the early 1950s, has died at age 90. Whitman, born in Tampa, Fla., was a regular on the influential country radio program “The Louisiana Hayride” starting in 1950, and first hit with the eerie country pop song “Indian Love Call” in 1951. His death Wednesday at a Florida hospital was due to heart failure, said his son-in-law, Roy Beagle. Discovered by future Elvis Presley manager Col. Tom Parker while Whitman was touring the South, Whitman — with Parker’s guidance — landed a record deal with RCA (the same label Presley would record for after leaving Sun Records). Over the next few years, Whitman was a steady presence on the country and pop charts. He successfully crossed over in England, where his song “Rose Marie” hit No. 1 in 1954, and he joined the Grand Ol’ Opry in 1955. Whitman’s musical style was snuffed with the rise of rock ‘n’ roll, but a few decades later his voice would again reach a mass audience. In the 1970s and early ‘80s, his career was revived by a landmark telemarketing campaign that blanketed the country’s local stations with pitches for “All My Best,” a greatest hits collection. Geared toward the pre-Elvis generation whose baby boomer kids no longer controlled the parents’ stereo, “All My Best” sales soared and drove Whitman in follow-up ads to declare himself to be “The Biggest Selling Record Star in TV Music History!” He also claimed to have sold more albums than the Beatles and Presley combined — at least 120 million by some accounts. Whether accurate or not, Whitman was ubiquitous for a few years, and the ads drove a renewed interest in a graceful singer whose style predates the similarly mellifluous Roy Orbison.